We had a question about the beginnings of camping in Letchworth and, of course, we thought it would be simple to answer since camping is such an important part of the modern Park. But tt proved to be a harder question than first anticipated. But, with the help of early brochures, maps, reports, and helpful Park employees, we were able to create a "glimpse" of camping at Letchworth State Park. 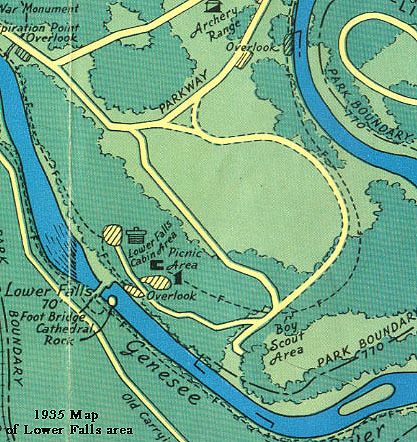 The American Scenic & Historic Preservation Society was manager of the Park from its inception to about 1930 and their report of 1920 does not mention any activity in the relatively new park except automobile traffic and people sleeping and eating at the Glen Iris Inn, operated at that time by Charles Baeder as concessionaire. The first mention of camping appears in the 29th annual report (1924). According to that report, camping was inaugurated in the plateau near the Lower Falls in 1923. Tents and cots were installed and the necessary fire, water and toilet facilities arranged in June and on July 7 the camp-ground was opened. The campers on July 27 included 22 boys from the Bradford Pa , YMCA. On August 1 eighty eight persons were camping there. During the brief period during which the camp-ground was available there were 352 campers. All expressed uniform satisfaction and it is evident that the popularity of this healthful form of recreation will necessitate larger facilities in the coming season. The photo shown above, labeled "Tourist camp ground at Letchworth Park, near Lower Falls," appeared in a brochure about the Genesee Valley communities and attractions that has no date, but the content indicates it was printed between 1910 and 1930. The photograph (along with another that appears in our book on page 105) was probably taken in the mid to late 1920s. The tents are on platforms which give a feeling of permanence and the area looks like it might be along the road back past B Cabins to the area known as the "Octagon Area." The 1935 map does not show a road extending down to the area where Lower Falls picnic area, South Pool, Cabin Area "A" and Lower Falls Restaurant are located today. In 1935 that area was designated as "Boy Scout Area." It is likely that the early "tourist camp ground" disappeared when the Depression Era CCC program began to build additional cabins and picnic areas near the Lower Falls and completed the modern day Lower Falls road. It appears, however, that the Park had not abandoned the idea of public camping. The park files contain a proposed camping area map that is dated 1937 with a revision in 1938. Two familiar names are on the plan, designer C. Cromwell and checker Tom Hance. The plan was designated as a project for SP 49, the Lower Falls CCC camp, and the locater map shows it on Chestnut Lawn farm which today is the site of the primitive Group Camping and Winter camping area on Lower Falls road. A portion of the plan is shown below. It shows camping loops with individual sites in a very strict geometric form rather than one that varies according to the topography of the land. The modern winter camp area opened in 1968. Further research into old park brochures with maps show a camping area at St. Helena in 1954. Retired Park Patrolman Don Gibson remembers the effort to contain this activity for safety reasons - both for the campers and the park because of the out-of control camp fire problem. We also examined minutes of the Park Commission meetings and found that in 1954 improvements were made to the camping area at St. Helena that included a better water system, grading and a new access road. On the 1954 map the camping area appears to be at what is known today as the "middle level". So the exact time when camping became a recognized activity in the park will have to wait for a later amendment when we can fill in the blank. 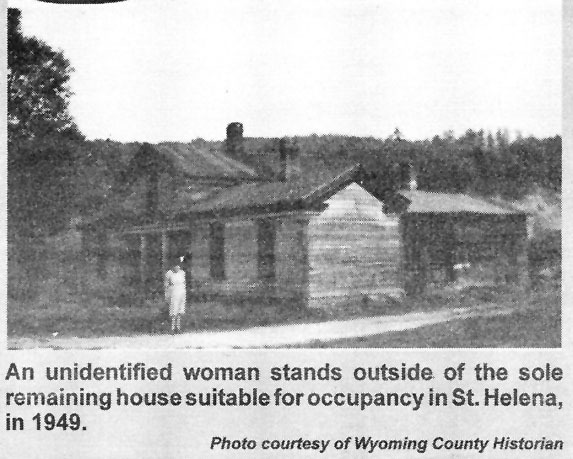 According to Mildred Anderson's "St Helena, Ghost Town of the Genesee" the village still has a resident up to 1948 so it is doubtful that any public activity like camping in the St Helena vicinity was started until after the last resident moved away. (see 1949 photo) Further, Mildred reports that the house of this resident was not torn down until 1951 so this begins to narrow down the possible time for the beginning in the St Helena vicinity. Of course we are all familiar with the great camp ground that now exists as you enter the park at the Perry Entrance. The Highbanks Campground opened in 1963. One thing that was fascinating as this story was researched was the price of various aspects of the park experience over the years. The chart below will help illustrate how things changed in price as did everything else over time. It is interesting to note that the Guide Map printed in 1956 has an area on the map designated "St Helena, Picnicking, CAMPING, Fishing." 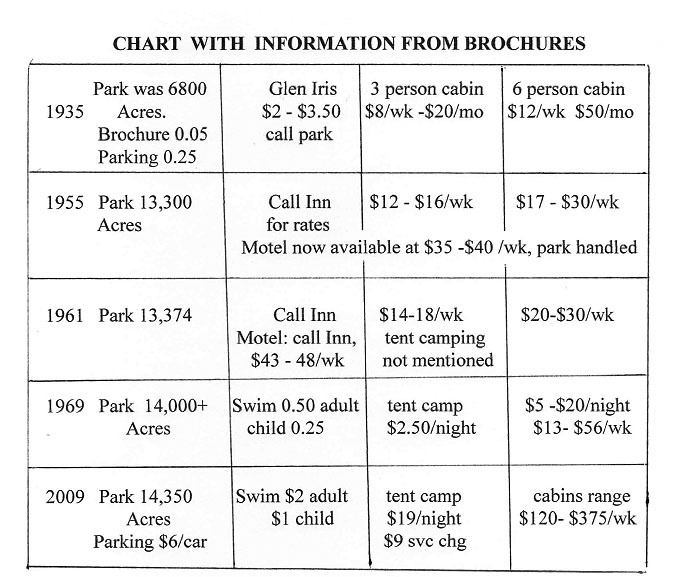 From the beginning of publications that we have access to the overnight facilities are designated as either the Glen Iris or "camping cabins." One report was discovered that told of a significant statistic that in 1958 there were 496,000 visitors to the park and the cabins were in use for 34,000 patron days. 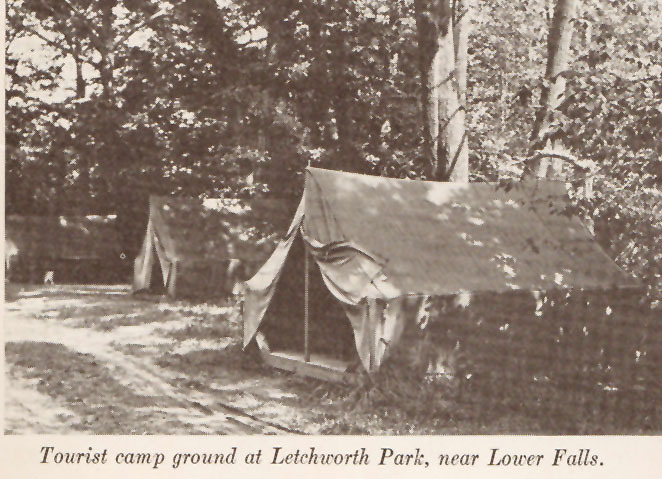 Camping has clearly been an important part of the Letchworth experience through most of the Park's history. (We can even speculate that camping became a "cool" thing to do way back to the Civil War or even World War I when the "dough boys" were in pup tents guarding the Portage Bridge. ) We have only provided a brief summary of the development of public camping, and hope that Park visitors and former employees can provide more details. For example, we are fortunate to have one amazing lady at 100 years of age who recalls camping in the Park in the 1930s and has a vague recollection that she paid a fee, and that others were camping too. She can also remember that CCC boys were working in the park at that time. She is the wife of the first State Policeman who was the first occupant of the "Stone House" (at Inspiration Point) as part of his official duties. We would welcome information from anyone who can add anything to our knowledge of camping in Letchworth State Park! Special thanks to Letchworth's Stephanie Spittal and other Park friends for sending us important camping information!